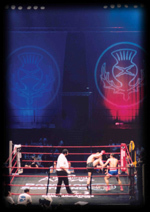 Braehead Arena featured the very best of Scotland's full contact martial arts fighters. The show put Scotland on the martial arts map. The spectacle viewed live by thousands of spectators was also filmed for Eurosport to be broadcast to 250million people in 54 different countries.